Truckee swimmer Alex Straw races in the Divison I-A state championship last season. Straw received a scholarship to swim at the Universitiy of Hawaii. * Indicates new school record. Look out for the Truckee High swim team next season. With a crew of just eight boys and eight girls, many of them underclassmen, the Wolverines returned from the Division I-A state championship meet in Carson City this past weekend with 13 individual medals — three of them gold — and six medals among their relay squads. Both the boys and girls also placed second as a team behind top Southern seed Boulder City, which boasted a state squad more than twice the size of Truckee, with 35 swimmers. “I’m really proud of how they performed, and I’m also really looking forward to next year as well, because they’re going to be making moves again,” said Truckee coach Betsy Redmond, who had only one senior at the state meet. The state results easily marked the best in Truckee swimming history, in part because it’s the first year the Wolverines competed solely against their Division I-A (formerly 3A), and were not lumped in with the larger Division I (formerly 4A). Yet, with all their top results, they still would have finished highly in the old mixed-division league, said Redmond, who has coached many of the team members since they were youngsters on the Truckee Tahoe Swim Team (TTST), the local youth club program headed by former Olympian Debbi Meyer. One of Redmond’s TTST swimmers from a young age, junior Alex Straw, led the Truckee charge at the state meet. 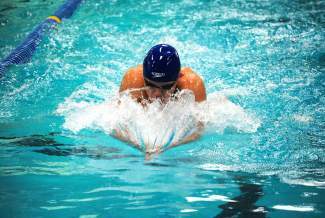 He won state titles in both the 200-yard individual medley and the 100-yard breaststroke, establishing new school records with times of 1:54.72 and 56.70, respectively. Along with Jake Hamilton and brothers Kaleb and Marcus Rodarte, Straw also helped lead the 200 medley relay and 200 freestyle relay teams to second-place finishes, again in school record times of 1:39.19 and 1:30.95, respectively. After the meet, Straw was named one of three Northern swimmers of the year, along with Ben Lerude of Reno and Patrick McCrillis of McQueen. Straw’s younger sister, freshman Brittney Straw, earned Truckee’s other individual state title, as she won the 100 breaststroke with a time of 1:06.23. Brittney Straw also placed second in the 100 butterfly and was a member of the second-place 200 medley relay, with Niki Kates, Ingrid Suter and Brittany Percin, and second-place 400 freestyle relay, with Kates, Amanda Novick and Percin. Other dual medal winners included Percin, who was third in the 500 freestyle and fourth in the 200 freestyle, Kates, who was second in the 100 backstroke and fourth in the 200 IM, Kaleb Rodarte, who was third in the 100 butterfly and fourth in the 200 IM, and Marcus Rodarte, who was second in the 100 backstroke and fourth in the 100 freestyle. Kaleb Rodarte’s 55.77 in the 100 butterfly marked a new school record, as did Marcus Rodarte’s 54.49 in the 100 backstroke. Hamilton was third in the 200 freestyle to round out the Wolverines’ individual medals, which went to the top four finishers in each event. The Truckee girls 200 freestyle relay of Suter, Kyla Burrill, Annie Kruck and Novick finished third, and the boys 400 freestyle relay of Andrew Clusserath, Devon Kim, Bayley Sonder and Sam Robertson took fourth. Both the Truckee girls and boys also received trophies for finishing among the top two. The girls were runner-up to Boulder City with 97 points to Boulder City’s 193. South Tahoe’s girls were third with 56 points, followed by Fallon (46), Faith Lutheran (36), Chaparral (28), Lowry (25), Clark (21), Sage Ridge (9), Cheyenne (5) and Southeast Career Tech Academy (2). The Truckee boys tallied 96 points to Boulder City’s 191. Sage Ridge was third with 58.5 points and was followed by Clark (50), Virgin Valley (26), South Tahoe (22), Cheyenne (16.5), Faith Lutheran (16), Fernley (15), Western (11), Lowry (11), Mojave (9), Southeast Career Tech Academy (8), Fallon (7), Incline (3), Moapa Valley (2) and Sparks (1).